The HTC EVO[tm] 4G is Here-10x faster than 3G*! first 4G phone and has wicked fast web speeds. processor for faster applications, dual cameras, and a huge 4.3"
apps you've come to expect from an Android[tm] enabled phone. devices and low-cost data plan for deaf and hard of hearing people. kbps-1.7 Mbps); 4G avg. speeds (3-6 Mbps). Actual speeds may vary. Don't have a Z phone? possibly be the world's best deaf female golfer. funded by the Nancy J Bloch Scholarship program. Chris Patterson and Julie Rems Smario. be it as the next CEO. This is wonderful news for the greater deaf community!! MSSD designs. He, however, was not deaf. will be aired next week. William Woods University in Missouri. through the ups and downs. We wish her much success in her new role. The largest web survey of deaf and hard of hearing people in U.S.
way to a service industry. that policies can assure competitive employment for our youth. Data from this study will be made available to all who are interested! In Deaf Culture, it is ok. Which is better - Deaf Culture or Hearing Culture? fair takes place on August 11, 2010 from 9 a.m. until 3 p.m.
from several state and federal government agencies. and an explanation of the Schedule A package, see page 2 of this release. operating division with everyone who attends the career fair. please make sure you type:  "August 11, Salt Lake City Utah Career fair." Failure to do so may result in your package being overlooked. hiring officials in various operating divisions. right to conduct an interview on the spot. know what a radio is all about! the small town where the deaf man lived. times, each time into millions of dollars. WHY DO PEOPLE ATTEND CONVENTIONS? Now, why do these people attend conventions? previously acquainted with the editor. one reason - he never heard of Gallaudet before. He even also never heard of NTID, either. was Gallaudet mentioned in these deaf circles. 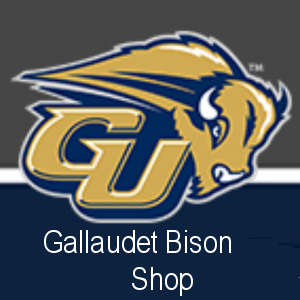 of the existence of Gallaudet. but it is sort of hidden from public view. deaf residents that move to residences in the town. 20 deaf people - but where are they? This is the big challenge. you can't even get a hot dog for this  at other hotels! over a dozen other highly recommended presenters. See ASLImprov.com for a separate event at the silent weekend. 11. Classy refreshment breaks including a decadent chocolate fountain! peace of mind in planning your  professional training! is noise worse now than in the past? not quite sure if it is a valid statement? examiners can use flash cards or other methods of communicating. emergency vehicles approaching from behind. a waiver during the last five years. betterment of his West Virginia constituents. a discrepancy of 444 ? health/medical, education, social, employment and legal services. as well as ensure that appropriate information pertaining to clients. SALARY: $36,244  - $37,694  DOE, plus customary benefits. - Familiar with (or willing to learn) Case-management practices. Special Education, ASL & ESL endorsements. Teacher start date is August 16th, 2010. Institute for the Deaf (NTID). NTID's ability to function effectively. 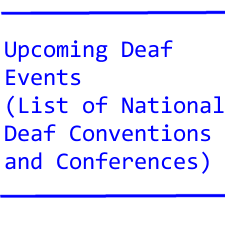 of deaf culture and deaf community. consideration, applicants are encouraged to apply by August 1, 2010.
are encouraged to send an application.